EcoMatcher is pleased to introduce TreeCorder 2.0, THE app bringing full transparency in tree planting. TreeCorder 2.0 is an Android app to register newly planted trees and the planters planting the trees. The TreeCorder app makes it incredibly easy for tree planting organisations to take photos of each tree once they are planted. 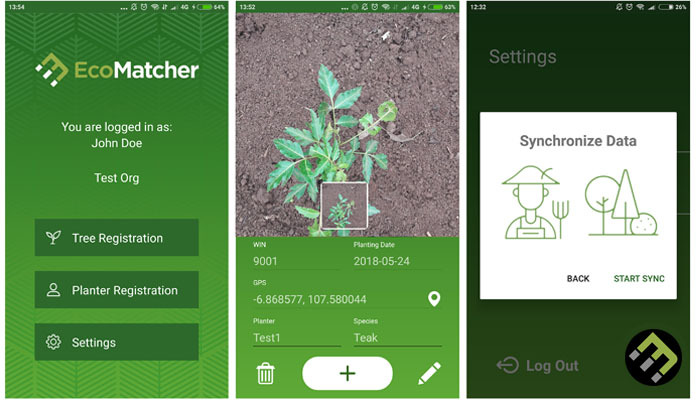 The app automatically registers the GPS coordinates, the date of planting and assigns a unique number to the tree. You can also enter the tree species and details of the planter, including a few photos. We have built in numerous error detection features, for example to detect when there is poor GPS accuracy or when someone accidentally takes a second photo of the same tree. TreeCorder works in offline mode and can upload data to the cloud when the planters get back to a mobile network or Wi-Fi, even if those networks are poor and have low bandwidth. The app is designed to work on low end and even relatively old Android devices. TreeCorder brings transparency to tree planting, not only for the ones adopting the trees, but also for the tree planting organisations themselves as EcoMatcher now can provide those organisations with digital tree planting maps. TreeCorder can be downloaded from the Google Play Store.